Brynn and I went to the "Eat & Run Experience" at Fleet Feet last night and it turned out to be an even better event than we expected. First of all, there were wayyyyy more people taking part in the running part than we expected - more than a hundred (maybe 150). 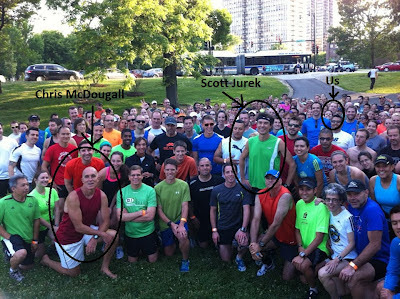 We got taken out to the Benjamin Franklin statue in Lincoln Park to get ready for the run and Scott Jurek and Chris McDougall joined everyone around 6:30. There was a moment of silence for Caballo Blanco and then we just started running. Scott and Chris (who was running barefoot) were just running in the pack along with everyone else. We ran next to Chris for a while and listened to him talk to people and basically just have a good time. When we turned around at Fullerton, Scott was waiting on the side of the trail giving everyone high-fives. It was just a really awesome run and a great experience. One thing: it was listed as a 4-mile run but ended up being just short of 2.5 (but who's counting right? Definitely not me or Brynn... not like we mapped it right when we got home or anything). After the run we made our way back to the Old Town AMC Theatre where the presentation/discussion was going to be happening to get our bags and grab some seats. The whole presentation was really great. It was low-key but also entertaining and exciting at the same time. It was just Scott and Chris doing a little back and forth discussing distance running, Scott's amazing running career (my uncle has run Western States four times so I've been hearing about the mythical Scott Jurek for years now) and Scott's vegan diet. This blogger captures some of the highlights really well. What struck me the most throughout the night though was what a perfect point the running community is at right now. It's become a really popular sport in its own right, popular enough to have "celebrities," but it's still small enough that those "celebrities" are able (and willing) to come out to a FREE run in the park with around 150 people and just run alongside them and chat and enjoy the company. They're just doing something that they love to do and enjoying the fact that other people want to come out and do it with them. And during the presentation/discussion I really loved that both of these guys are just polished enough - they're not up there spouting off platitudes and cliches, but they're also not stumbling over their words or seeming ill-prepared. Both of them just seemed like guys with microphones who were super-excited to be talking about the thing they love with a captive audience that also loves that same thing. Scott even took pictures of the audience before he started talking - which just reminded me again what an amazing place the sport of running is at right now. There are hundreds of people interested in hearing this ultramarathoner talk (the event sold out) and he's still excited about that! So excited that he took a picture of us before speaking and then both he and Chris commented on how many people there were. They sold out of copies of Scott's book that the event was promoting (Eat & Run) but promised to get more signed copies shipped to a local bookseller by next week for those that wanted a copy. Anyway, overall it was a really great experience and even better than I expected it to be. One big takeaway - the 100-Up - Chris talked about it last night but wouldn't demonstrate it - he just told us to Google it. So, I guess it's something we need to be doing, fellow runners. Meanwhile, we picked up our packets for the 13.1 half marathon tomorrow morning. We're not looking forward to catching a shuttle ta 5:30 but we ARE looking forward to the run! Sounds like an awesome event! I agree that the running community is really awesome right now. I only started running two years ago and didn't really get into the community until last year, so I don't have much to compare it to, but I love how supportive everyone is! I have a co-worker who has been running forever and is super fast (in my opinion) and he never makes me feel slow or like a n00b. He always asks me about my races and answers my questions. I think generally runners just love having someone else to talk about running with. I feel like all my non-runner friends tune me out / don't get it when I talk about running. I think you might be on to something there - runners love talking to other runners because it lets us go on and on about running without boring anyone. And right now the sport of running is at a point where it's just getting big enough to generate events like the one last night where well-known (within the running world) people can come and speak to a packed house of people who are hanging on their every word. That's exciting for everyone involved! What an awesome event! I wish I had known about it. I need to keep up on these things.